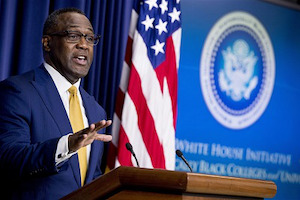 WASHINGTON — Competitiveness is the theme for this year’s National Historically Black Colleges and Universities (HBCUs) Week Conference hosted by the White House Initiative on HBCUs. Centering around the theme “HBCU Competitiveness: Aligning Institutional Missions With America’s Priorities,” presidents and representatives from the nation’s HBCUs, policymakers and stakeholders had the opportunity to learn about federal agency opportunities, partnerships and research opportunities, innovation development, workforce development and more in order to prepare HBCUs, their students and faculty to compete nationally and internationally. Dr. Johnathan M. Holifield speaking at the White House Initiative’s National HBCU Conference Week. In a breakout session on establishing and leveraging public-private partnerships, panelists spoke about how HBCUs can secure contracts with industry and government partners, build research capacity for economic development and participate in several opportunities for institutions’ faculty and students to work with federal and independent agencies and organizations. Dr. Legand L. Burge Jr., president of LLBurge and Associates, LLC, gave a brief overview of applying for contracts, which include elements such as a proprietary information agreement; a global memorandum of understanding; teaming agreements; a statement of work; and an understanding of cost orders, among other components. Drafting this institutional “resume,” HBCUs should include in their contract proposals the resources they have to offer, existing competencies and other emerging capabilities, Burge said. Darold L. Hamlin, president and executive director of Emerging Technology Consortium, acknowledged that the number of federal contracts is going down, but that grant awards are rising. “Be mindful that [HBCUs] need both in order to be successful,” Hamlin said, adding that HBCUs should be partaking in research opportunities to not only build revenue streams from federal and industry partners, but also to compete with other research universities. Panelists from the U.S. Department of Treasury, the Council on Foreign Relations, Oak Ridge Associated Universities and the Advisory Council on Historic Preservation (ACHP) encouraged HBCU leaders, faculty and students to reach out to them about partnerships or research, internship, fellowship and grant opportunities. Susan Glimcher, director and CEO of ACHP, said the most important thing HBCUs should do when leveraging partnerships is to make sure the industry or federal partner’s mission and purpose aligns with their own. “Smart” partnerships are also mutually beneficial, sustainable, a model for others, have clear communication, have measurable results and they require work on both parts, Glimcher shared. In another breakout session called, “HBCUs and Industry Partnering to Fast-Track Critical U.S. Skills,” participants highlighted IBM’s initiatives with higher educations to enhance curriculum and train faculty and students for the emerging science, technology, engineering and mathematics (STEM) workforce. Part of IBM’s outreach and partnerships with campuses revolves around engaging with students on campus-visits, hosting hack-a-thons, helping with institutional curriculum development and bringing IBM programs on leadership, digital responsibility and other skills development to students, said Gary Schneider, vice president of global technical sales at IBM. In addition to outreach and career development, IBM Global University Programs includes the IBM Academic Initiative, IBM Skills Academy and IBM Global Entrepreneurs. The programs, respectively, cultivate student, faculty and new entrepreneurs’ skillsets in artificial intelligence, cybersecurity, blockchain, cognitive computing, Internet of Things (IoT), quantum computing, big data/analytics and more. Prairie View A&M University and the New Jersey Institute of Technology have integrated IBM Skills Academy and IBM Academic Initiative into free faculty training and campus-wide boot camps and workshops on STEM skills for students. A comprehensive panel on the need for HBCUs to compete internationally touched on student and faculty travel, research and international engagement opportunities at the U.S. Department of State, the U.S. Agency for International Development and the U.S. Peace Corps. At the State Department, faculty and students can participate in the Fulbright fellowship and students can also participate in the Thomas R. Pickering Foreign Affairs Fellowship or the Charles B. Rangel International Affairs Program should they want to pursue careers in international affairs and diplomacy. Neil Boyer, environmental program specialist for the U.S. Peace Corps, said it is vital for HBCUs to encourage their students to study abroad, engage in language-learning experiences or cross-cultural experiences because agencies like the United Nations will ask potential job candidates to describe their prior international or cultural experience. “It’s almost like a chicken and egg, because if you don’t have those skills, where do you get those skills?” Boyer asked the audience. He also suggested that HBCUs raise awareness of programs like the Peace Corps as a “bridge” to working in economic development, foreign service, academia and other fields. Torian L. Lee, director of the Center for Intercultural and International Programs at Xavier University of Louisiana, underscored the importance for HBCUs to establish a senior international officer role to bring about internationalization throughout the institution. In his role, Lee works to attain buy-in from all departments to engage students in international and cultural experiences. He works to secure grants and contracts with study abroad programs and other contractors, and also lobbies private and public partners about international and cultural engagement opportunities for Xavier students. Similarly, Dr. Jewell Winn, senior international officer and deputy chief diversity officer at Tennessee State University, works to find innovative ways to bring about “comprehensive internationalization” at her institution through the curriculum and co-curriculum activities, faculty policies and practices and administrative structure and staffing. Winn noted that the strength of any efforts of internationalization comes through collaborations and partnerships across departments and with other partners, and by seeking money to fund efforts at HBCUs. Her office’s programming and resources have included a Cultural Appreciation Week, a Ms. Collegiate International Scholarship Pageant, a Global Scholar Certificate Program and a Passport Acceptance Facility. Winn added that a value of connecting international and traditional students results in exposing both to various cultures. “We have a browning country. It is both browning and graying at once,” he said of a shift in the nation’s demographics.